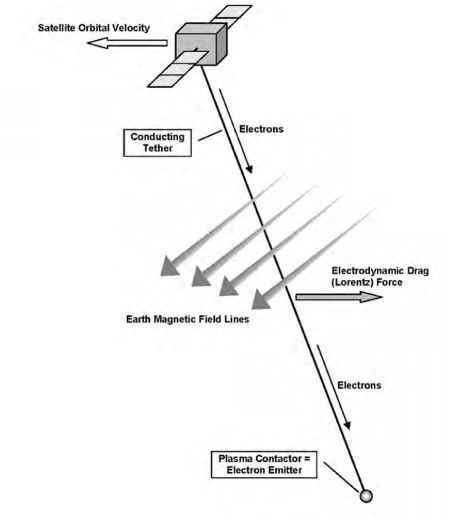 Electrically conducting tethers can also be used for purposes other than changing orbits of satellites and electrical power production. One interesting concept is to use them to remove charged particles from the vicinity of Earth. Van Allen, using data from the first American satellite, Explorer 1. The particles in the Van Allen belts pose a serious threat to satellites and people venturing into them. They can upset and even destroy sensitive onboard electronics, degrade spacecraft materials, and cause biological damage in the cells of astronauts' bodies. The Van Allen belts vary in intensity with latitude; they are thickest above the equator and diminish in the direction of the North and South Pole. Moreover, the intensity varies with altitude, so that spacecraft in the most useful orbits relatively close to Earth and satellites in high orbits such as GEOs are fortunately little affected. However, satellites transferring from low orbits to higher orbits such as GEOs or on their way to other planets necessarily have to fly through the belts. However, low Earth orbit satellites are not completely safe. Earth's inner Van Allen belts are symmetrically aligned with the planet's magnetic axis. However, this axis is tilted with respect to Earth's rotational axis by about 11 degrees. 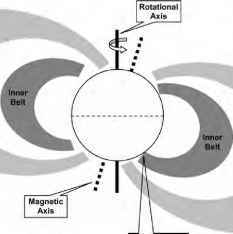 In addition, the magnetic axis is offset from the rotational axis by some 450 km (280 miles). Due to this offset and tilt, the inner Van Allen belt is closest to Earth's surface over the southern Atlantic Ocean. The consequence is an increase in radiation levels in region off the east coast of South America. This area is called the South Atlantic anomaly and can affect satellites in otherwise safe, low orbits between altitudes of about 500 and 1000 km (300 and 600 miles) (Fig. 1.16). Figure 1.16: A cross section of the Van Allen radiation belts and the location of the South Atlantic anomaly.